PRODUCT COMES FUELED, OILED, ASSEMBLED AND READY TO GO WHEN PURCHASED IN STORE. The UMS425 bent shaft is powered by Honda's powerful and lightweight GX25 four stroke engine. Eliminating the hassle of having to mix fuel and oil for your power equipment. With the Honda taking straight unleaded petrol unlike its 2-stroke competitors. 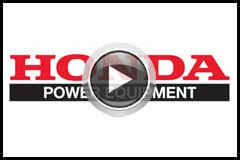 The Honda UMS425 is reliable and performs better than any competitor model in its class. The innovational Honda engineering ensures that you are purchasing a product that produces less noise and smoke, making it much more environmentally friendly than other opposing models. With the auto-decompression, electronic ignition, anti-flood primer system and Honda's famous one pull easy start system, the UMS425 Bent shaft starts first time every time, year after year. The lightweight bent shaft built makes it perfect for any domestic home and operator. And as usually Honda offer a 4 year domestic warranty, 3 year commercial engine warranty and 12 month commercial frame warranty on the UMS425 brush cutter.